The Presidential Delegation of Tahiti, Air Tahiti Nui head office and @Boeing celebrate the delivery of the first Tahitian Dreamliner in Charleston with our hostesses who brought a Polynesian touch with a beautiful dance performance! Boeing, Air Lease Corporation, and Air Tahiti Nui celebrated the delivery of the airline’s first 787-9 Dreamliner, via a lease from ALC. This is the first Boeing airplane to join the Tahitian airline, which plans to use the longest-range Dreamliner to replace aging Airbus A340s and connect its home base in the South Pacific with world capitals such as Paris, Tokyo and Los Angeles. 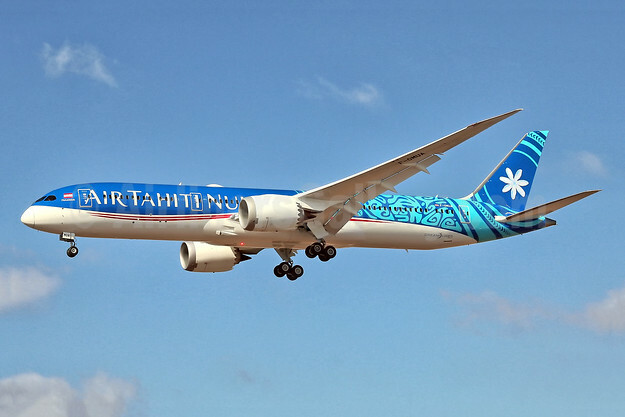 Air Lease Corporation on October 8, 2018 announced the delivery of the first of two new Boeing 787-9 aircraft on long-term lease to Air Tahiti Nui. This Dreamliner aircraft is from ALC’s order book with Boeing and is powered by GEnx-1B74/75 engines. All photos above by Air Tahiti Nui. Below Copyright Photo: Air Tahiti Nui Boeing 787-9 Dreamliner F-OMUA (msn 39297) LAX (Michael Carter). Image: 943871. This entry was posted in Air Tahiti Nui and tagged air tahiti nui, Boeing 787-9 Dreamliner, F-OMUA, msn 39297 on October 8, 2018 by Bruce Drum.